Below is a blog I wrote one year ago during my 4,400 mile bicycle ride for Heroes. 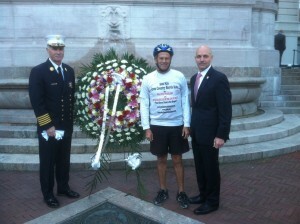 FDNY Commissioner, Salvatore J. Cassano on the right in today’s photo and Chief of Department, Edward Kilduff, sought me out this morning at the 9/11 Memorial to thank me for visiting all 212 Firehouses in the five boroughs of New York City. It was an honor to say the least, being acknowledged by these highest ranking officials. Dozens of Firefighters from Firehouses I had visited, came by to say hello and thank me once again for honoring the 343 who lost their lives. The 11th annual memorial is way to never forget those who made the ultimate sacrifice. The National Anthem as well as Amazing Grace were sung by a very talented singer. All 343 Firefighter’s names were read along with their rank and a bell tolled after each. Taps were played after a beautiful sermon. Many reflections were shared after the memorial. This entry was posted on Wednesday, September 11th, 2013 at 6:19 am	and is filed under Kindness. You can follow any responses to this entry through the RSS 2.0 feed. You can leave a response, or trackback from your own site.